The 2017 Toyota Prius Prime replaces the Prius Plug-in Hybrid, which Toyota stopped producing in June 2015. The 2017, however, is a new, different, and significantly improved machine. It is a functional, reasonably-priced and well proportioned compact car, that will keep your gas card in your wallet. 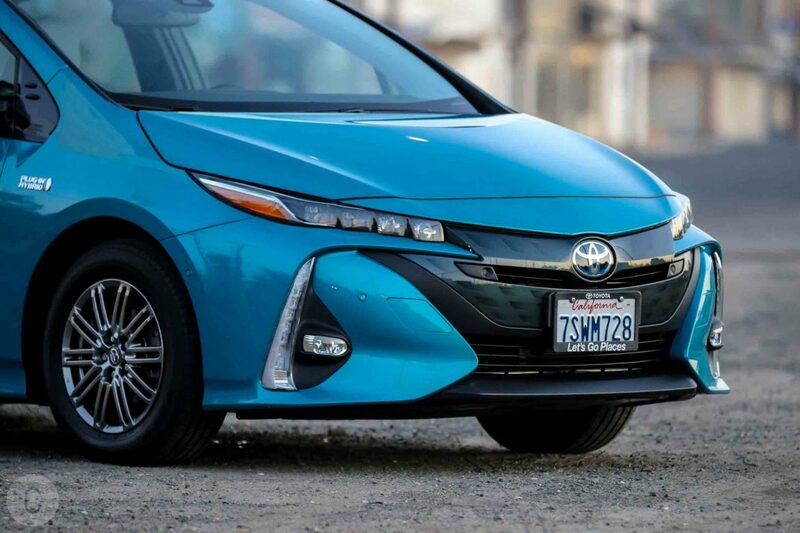 The Prius Prime is delivered in three trim levels: Plus, at the basic level, Premium in the buyer’s comfort zone and Advanced for drivers of discernment. The 2017 Toyota Prius Prime Advanced pops off the page. From its curves to its powertrain, the Toyota Prius always has been the last word in ergonomic design and maximum fuel efficiency. The 2017 model, while losing nothing in aerodynamics, and nor in efficiency, is a mid-sized commuter with more than a little attitude. Everything about it is Toyota, but the two-tone grill, penetrative Quad-LED headlights and a scowling front-end are just a little edgier than most. 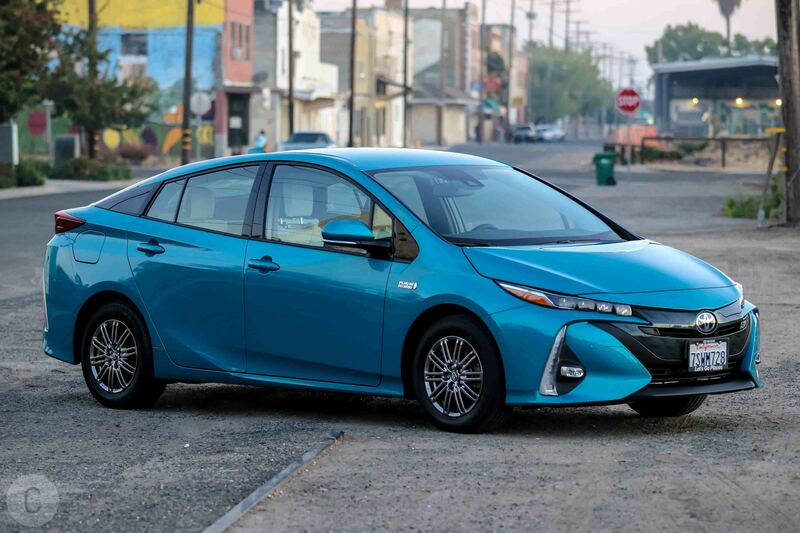 For conservative, traditionalist Toyota lovers, the 2017 Toyota Prius Prime Advanced might be pushing the boundaries of automotive style and allure a little too far. It is, after all, a humble commuter, but the Prius Prime has nonetheless taken that step. With a hypermodern LED wraparound taillight integrated into the spoiler, and a flourish of black glass, she’ll get you through the traffic in the morning, and turn a few heads doing it. For us, the 2017 Toyota Prius Prime Advanced is just what the doctor ordered, aggressive and modern, but at the same time, one of the best ‘green’ cars on the market. Our test car came dressed in ‘Blue Magnetism’ livery, a little jade and a little turquoise to challenge the safe and neutral tones of emerging automotive greenery. Her seats and steering wheel were clad in SofTex, a synthetic leather with the smell and texture of the real thing. As a finish, it is more breathable than leather, less prone to overheating on hot days and it wipes down clean. The interior color scheme is strikingly two-tone, with Moonstone trim and seats accented with black. The same sharp contrast embellishes the steering wheel, door panels, console and dash too. 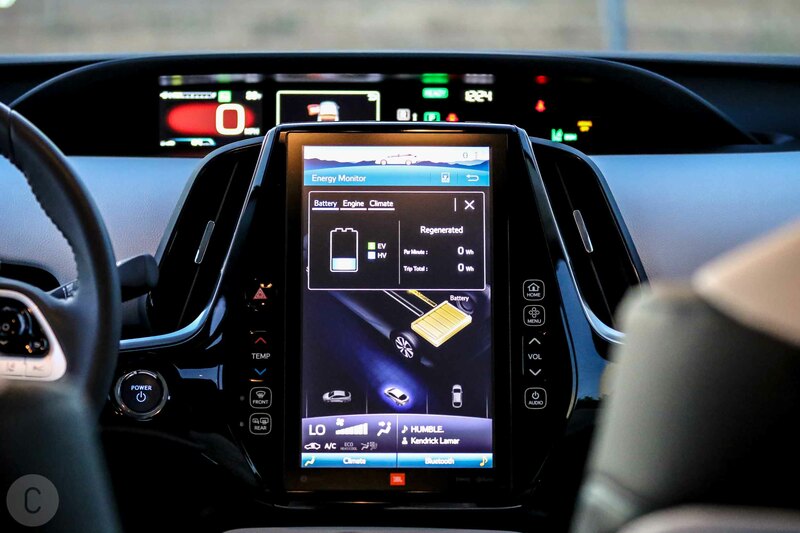 With a well-placed screen display and ergonomic controls, the Prius Prime is as modern and eye-catching on the inside as she is edgy on the outside. In the automotive industry, blue is the new green. In the early days of hybrids and electrics, green was the badge of belonging, but lately, carmakers have been adding a little electric blue. That blue glow around the badge, a touch of blue to the interior trim, a line of blue stitching here and there and a blue shifter, all add a little energy to the mix just to keep your heart pumping. The ergonomics extend to the seating, which is supportive and comfortable, with armrests to add room, and a sense of spaciousness and thoughtful design in every feature. The 2017 Toyota Prius Prime Advanced is a four-seater, primarily in the interests of weight and functionality. In the rear, the Prime’s trunk losses out a little to componentry, as the larger, high-mounted battery cuts into stowage space, although a clever concave of the deck sides adds a few inches on either side. At the business end, the dash cluster is center-mounted above the screen console, as opposed to driver mounted, which is the more usual, but again, this gives the interior a racy and unusual feel. The display is centrally mounted, featuring an 11.6 inch HD touch-screen with split-screen display and integrated backup camera. Besides all the usual climate controls, infotainment, GPS and Bluetooth functions, and of course the Entune App Suite, you can easily charge your new iPhone 8 or 10 with the Qi charging space. Since most of the controls are center-mounted, the Head-Up Display feature makes very good sense, helping keep your eye on the road where it belongs. Head-Up Display is an innovation inspired by aircraft technology, presenting basic information such as speed, energy monitor, battery and Toyota Safety Sense (TSS) alerts, as well as navigational information in your forward vision, reflected on the glass ahead. 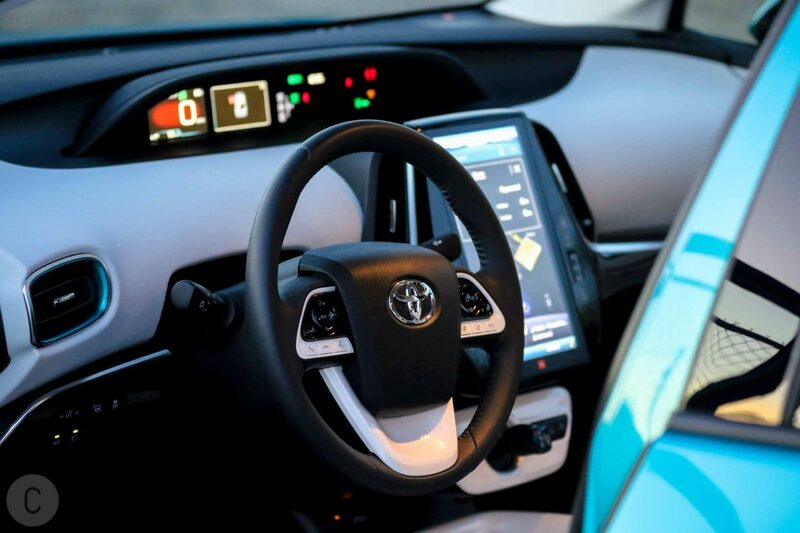 The 2017 Toyota Prius Prime Advanced is delivered with the following standard safety features: pre-collision system with pedestrian detection; lane departure alert with steering assist; auto high beams; full-speed range dynamic radar cruise control; blind spot monitor with rear cross-traffic; LATCH (Lower anchors & tethers for children); engine immobilizer and tire pressure monitor system. 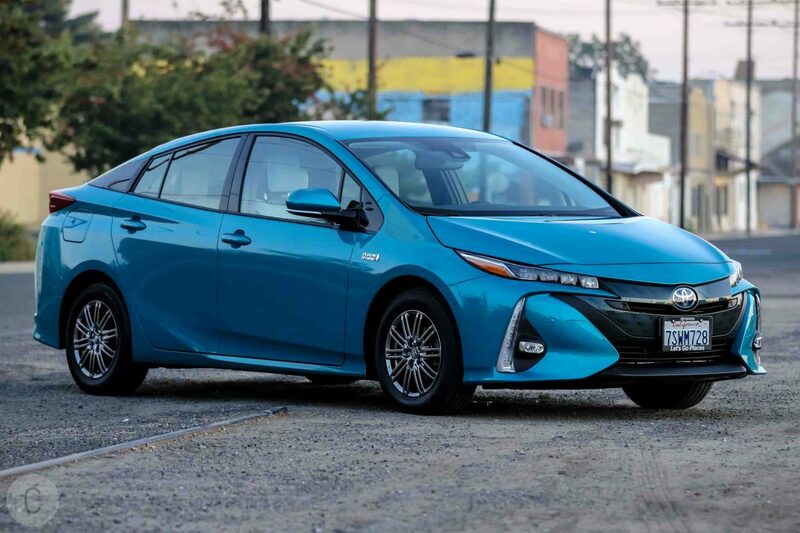 The Prius Prime is rated by the Environmental Protection Agency (EPA) at 54 mpg, and 133 MPGe. For those not familiar with the latter rating, this is the grand total output offered by both gas and battery power. Therefore, according to the EPA, the total driving range of the Prius Prime totals an impressive 640 miles. Despite its stats, however, when we got our test model out on the road, we had no problem pushing the Prime over its 25-mile battery limit. 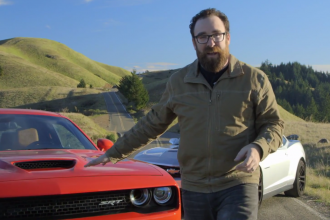 We were also able to push it past its EPA fuel consumption rating too, although, as hybrid drivers will agree, there is an art to getting the best out of your car, and it helps to figure out how to most effectively drive it. Here we get to the nuts and bolts of what the Prius is all about. The 2017 Toyota Prius Prime Advanced is powered by the same engine as the Prius liftback model, which is a 1.8-liter, Atkinson-cycle inline four-cylinder that pushes out 95 horsepower. Alongside this, an 8.8kWh lithium-ion battery delivers more than double the capacity of the Prius Plug-in Hybrid battery that it replaces. At 5,200 rpm, the Hybrid’s net output is 121 horsepower, and at 3,600 rpm, 105 lb.-ft. of torque. The Prius Prime has three different drive modes to choose from. HV mode, which combines fuel power with battery power to drive the vehicle. EV mode, which deploys only electric/battery power, and gives out a range of 25 miles per single charge. EV Auto Mode alternates between the two for the most efficient drive under any particular conditions, relying mostly on electric power, although utilizing the fuel engine when required. 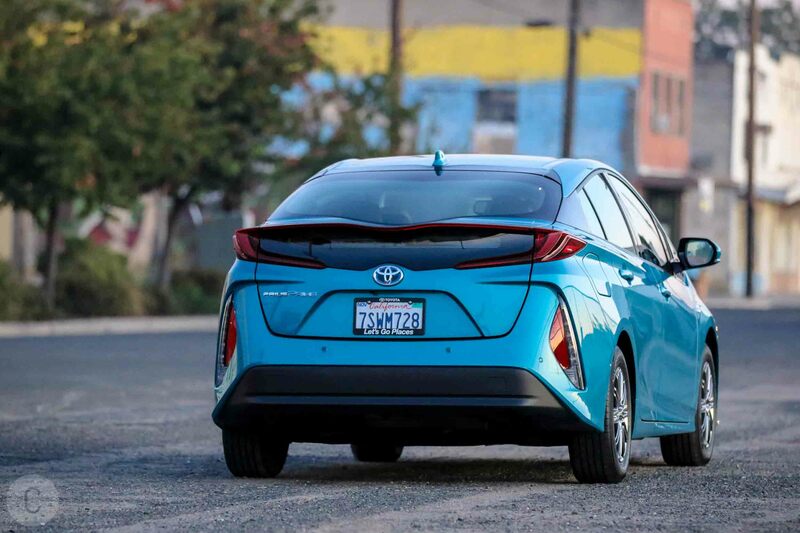 It is worth noting that the Prime is the first Prius to use a dual-motor drive train, which makes use of the generator as an auxiliary motor in addition to its assigned role as a starter and power regenerator. 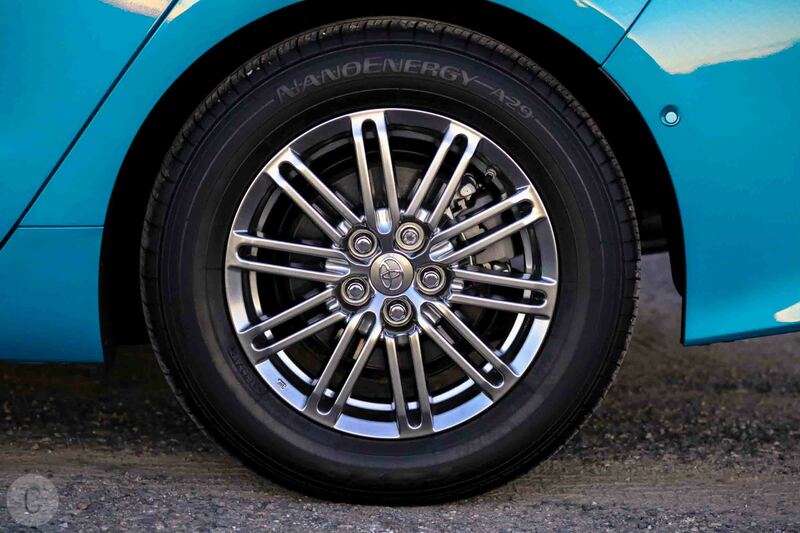 Therefore, when in EV mode, the wheels are powered by two electric motors, which, of course, simply adds to range and performance. Now we start to get deeper into the beast. 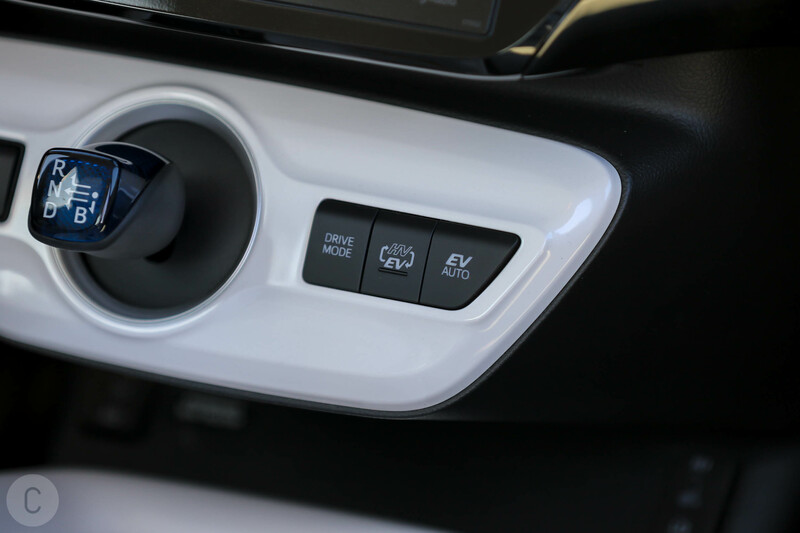 In each of the three drive modes, sub-modes can be selected; ECO, Normal and Power. The distinction, of course, is obvious, and the difference between them is simply in acceleration. In ECO mode, there is a slight reluctance to respond to the pedal, although this evens out as acceleration takes effect. Normal, needless to say, is normal, while Power lets the horse out of the gate, and she is a little more inclined then to gallop. The blue gear shifter is set into the bottom center of the dash, and at first, it can take a little getting used to. To tell which gear the vehicle is in, it is necessary to check the dash display, which is unusual, although the manufacturer included a sound alarm to indicate that reverse has been selected. Once on the road, however, you can settle easily into a comfortable drive, with the feeling that you are handling a comparative hatchback in the same class. Steering is light and reactive, and all-round visibility is outstanding. In city conditions, however, the Prime is right at home. Onramps, offramps and in the parking garage, the 2017 Toyota Prius Prime Advanced was full of surprises. The regenerative braking system seemed sluggish now and again, and that heavy battery mounted high at the rear was never far from our minds. Most of the test drive was in HV Normal mode, however, and that offered us a smooth and relaxed ride, especially on the long open road between Lodi and Yosemite and back, a 400-mile round trip without one stop for gas. When we switched to EV mode, a 25-mile commute seemed very reasonable, and if you happen to commute to work, and your commute is under 30-miles, then so long as you remember to plug in, you will not have to tank up all week. You’ll also have to watch your speed. 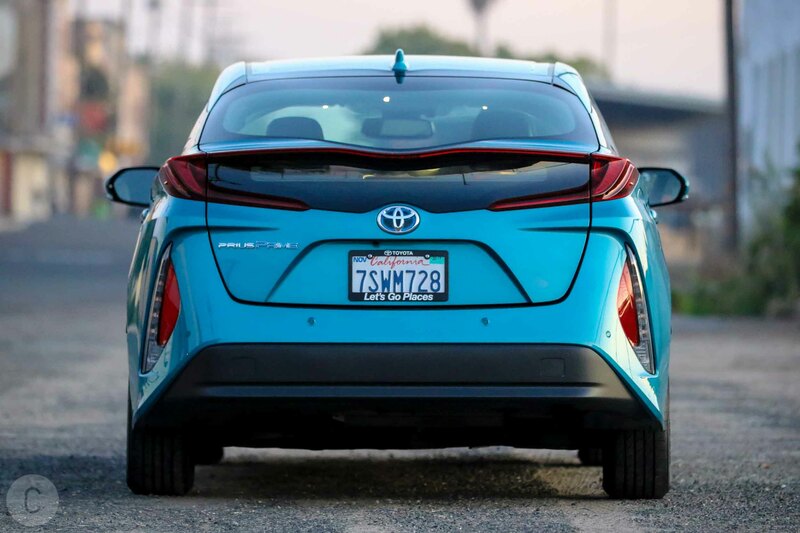 The Prius can deliver up to 84 mph on electric, but remember that this drains the battery fast. Finally, charging times. From zero to maximum takes about five and a half hours on a standard outlet. At public outlets offering 240v, charge times can be cut down to about two hours. Toyota lists some 20,000 charging stations throughout the United States, and of these, 60 percent are free. You can, of course, run a conversion in your home to 240 volts, but that is hardly essential. Charging up a hybrid is as simple as plugging it in. If you need to keep a remote check, LED lights indicate the level of charge, so you can tell at a glance whether you’re charged or not. The MSRP for the 2017 Toyota Prius Prime Advanced is $33,100, but once you take into account all the available extras and options, the price usually calculates out closer to $36,305. What we liked: We liked the more aggressive styling and the general interior quality. The 11-inch tablet-like screen was cool, as were the safety features, and, of course, the high efficiency. What we didn’t like: The EV range did not win top marks, and nor did limited seating and rather uninspiring rate of acceleration. On the whole, the 2017 Toyota Prius Prime has pleasantly surprised the pundits, and much of that has to do with its default electric mode. Nonetheless, the 25-miles that it offers is less than half that of the Chevy Volt’s 53 miles. The Volt is also regarded by many as a better-looking car, with better performance, and with a more plush and classy finish, but notwithstanding the fact that it runs to several thousand dollars more, we think that the Prius Prime is more stylish, and it certainly had the design edge. Not to be forgotten are the Hyundai Sonata Plug-in Hybrid and the Ford Fusion Energi, which are both plug-in versions of standard mid-size hybrid sedans. Neither, however, offer the same sharp styling of the Volt or the Prius Prime, both of which are five-door hatchbacks.